Pearson's Renaissance Shoppe brings high quality Renaissance clothing and Medieval costumes to complement everyone's unique taste. Our authentically-styled Renaissance clothing truly suits every member of Renaissance society, from Wench Costumes for the wisecracking women with a sharp tongue, to Renaissance Dresses befitting prim and proper princesses. And don't think we've forgotten the peasants and swashbuckling pirates! We have plenty of options for you as well. We strive to offer Renaissance clothing that effortlessly transports you to a different time, whether you're donning a Medieval Wedding Dress, or gowns and doublets fit for Queens and Kings. Our collection features Men's Renaissance Clothing, Women's Renaissance Clothing, and Children's Renaissance Clothing as well. We're certain you'll find something special in our shoppe for the whole family, and we thank you for stopping by! We carry high quality Renaissance clothing, and medieval costumes - authentic medieval clothing that reflects your own unique style. Be you an authentic peasant, swashbuckling pirate, or nobility, dress to your taste and preference. Medieval dresses are perfect for the Fair, Re-enactments, and even as bridesmaids gowns. Whether you are strolling around the Renaissance Faire, planning a Medieval wedding, or dancing around the fires at Pennsic War, we create apparel that will take you back through the ages with timeless grace and beauty. Step into your renaissance character and be transformed to the Renaissance Era. The Nobility - The popular image that we have of Renaissance costume particularly that of England is what was worn by the upper classes. Style was paramount, and both men and women in the Renaissance wore clothing we would consider costumes, similar to the 'costumes' we wear in formal occasions today. To the modern eye, Renaissance costume appears to be highly constrictive and extremely uncomfortable. This is true, but only because we tend to associate the formal clothing of the nobility with the period. This is natural, as most of the examples we have of Renaissance clothing are from paintings and written descriptions. Historians and artists generally do not record the activities of the poor. The Poor - Clothing in the Renaissance for everyday became less like 'costumes', both in formal and daily wear as you went lower in the class system. Where a lady of the aristocracy might expect to wear a corset as a near requirement, except when in her chambers, a merchant's wife might wear a bodice that was heavily boned, but no underlying corset, giving her more freedom of movement. Going lower still, a peasant woman would have a single color, plain boned bodice. We have medieval and renaissance dresses, gowns, shirts and hats that come in a variety of styles, shapes, sizes and colors. To keep you warm during that cold medieval faire we have medieval cloaks, capes and robes. Finally we have period footwear like leather boots, suede boots and dress shoes to keep your feet warm and to add the final touches to your medieval outfit. We have styles for any occasion, whether you want to be an authentic peasant at the fair, a princess bride, the village idiot, or even the King, you are sure to find something here. 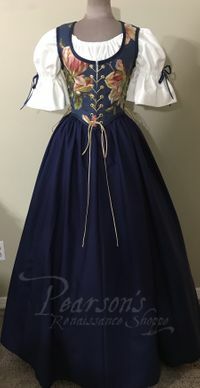 Pearson's Renaissance Shoppe carries Renaissance clothes for all, from the basic wench skirts and bodices, to beautiful medieval wedding gowns, and dresses and doublets fit for a Queen or King. Renaissance clothing for men, women, and children is our specialty. Browse our shoppe, you are sure to find something you like!